Winters in Montana can be fierce. The temperature can fall to 30 degrees below zero and the snow depth can rise to more than 15 feet. Bear cubs need to be prepared to survive the long winter. In a perfect year, under the protection of their mothers, they feast on berries and build up rolls of fat to sustain them while they doze through the long winter, but what happens when nature’s plan goes wrong? Many yearling bears are orphaned or abandoned during the spring and summer. 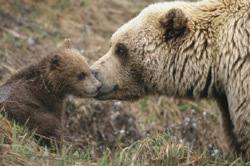 Mother bears are killed by hunters or hit by cars and if food sources are low the mother may see the cub as a competitor and push them away. Motherless bears usually die if they have no one to protect or feed them, but thanks to a program developed by Vince Yannone together with Montana Fish, Wildlife and Parks and with the help of Montana Kids many cubs are getting a another chance. 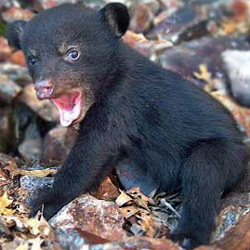 In 1998, a record, 33 cubs weighing only 6 to 10 pounds were rescued and returned to the wild. The first task at the recovery center is to fatten the orphaned cubs in preparation for their long winter sleep. The bears are fed wild grasses, fruits, and high calorie liquids to bring their body weight up to 85-125 pounds, double the weight of wild cubs. This gives them a better chance of making it through the cold winter. The cubs are then taught to "den." As winter approaches food is slowly cut back to nothing and the bears are placed in hay filled, plywood "denning box", built by Montana school-kids. Meanwhile, FWP biologists and Boy Scouts go into the wild and build real dens for the orphans. When everything is ready the cubs are tranquilized, radio-collared, wrapped in sleeping bags and snowmobiled to their new dens. The dens are dug six feet into the earth; filled with straw from their denning box and then packed with one to three sleeping fur balls. The opening is then covered with poles, branches and snow. In their cozy den the young bears body temperature will drop 5 degrees to 95 and its pulse will drop to 45, about three quarters of an active yearling. (In fact bears are not true hibernators, neither their body temperature nor their breathing drops as low as do true hibernators.) Bear specialists say the animals could survive the long winter in the woods, but it’s a lot easier to sleep. Their food is gone and their bodies have adapted to hibernation so it’s a good survival strategy. The young bears will drift in and out of sleep over the next few months. In late April or early May they will dig themselves out of the den and search of food. They must prepare for the next winter. In six or seven months, when the temperature drops and the days are shorter, biologists hope the bears will find a den similar to their first winter retreat. Thanks to Montana’s "denning" program, almost half of 140 cubs placed by FWP have survived. That’s about the same survival rate for cubs raised by their mothers.